Welcome to Nightingale Hospital (P) Ltd.
A Premier institution in the field of E.N.T. medical remedy since 1989. Avail the best diagnosis of your problems with the help of personnel friendly people at the most affordable prices. Get the best treatment for your ailments from the best team of doctors in their fields. E.N.T., EYE, CHEMOTHERAPY, GENERAL MEDICINE Departments available. Nightingale hospital specializes in the department of ENT and has the following equipments Which are not readly available in other hospital in other hospital in the North East Region. Pradhan Mantri Jan Arogya Yojana (PM-JAY). 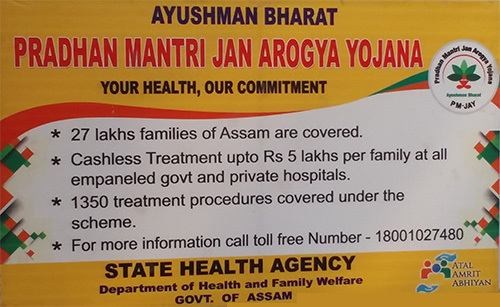 Nightingale Hospital (P) Ltd. is now proud to be associated with the Pradhan Mantri Jan Arogya Yojana (PM-JAY). Come and avail the benefits under this life-changing scheme. For more information, contact the hospital administration. Available from Monday to Friday. Contact 09706593362. Available from Monday to Saturday. Contact 0361-2342920, 2343869. Available from Monday to Sunday. Contact 0361-2342920, 2343869.